"Growing up, this was a staple in my home. This is a great recipe because the pork and rice cook in the same dish. 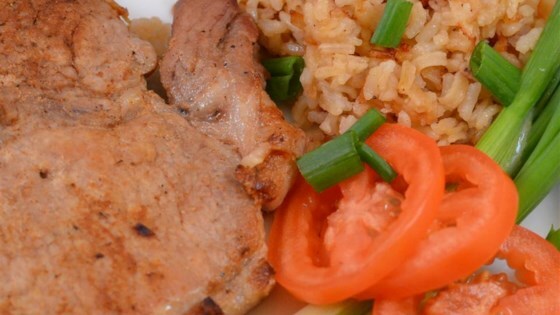 The rice is flavorful and the pork chops come out nice and tender." Melt butter in a large skillet over medium heat; cook and stir onion until golden brown, 15 to 20 minutes. Transfer onion to a plate. Sprinkle seasoned salt over all sides of each pork chop. Place pork chops in the same large skillet and cook until browned, 1 to 2 minutes per side. Mix beef consomme and water together in a 9x13-inch baking dish. Pour rice into the broth mixture; add caramelized onion. Gently arrange pork chops over rice in a single layer. Cover baking dish with aluminum foil. Bake in the preheated oven until pork is cooked through, 45 to 60 minutes. An instant-read thermometer inserted into the center should read at least 145 degrees F (63 degrees C).